Roughly half a million chickens perished in a fire at a Weld County egg farm Monday afternoon, authorities said. 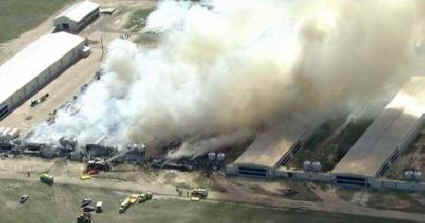 The fire at Moark Hatcheries, located at 9575 Weld County Road 73, was reported at about 1:30 p.m.
SkyFOX aerial footage showed several buildings ablaze and a large plume of smoke that was visible from several miles away. According to Weld County Undersheriff Margie Martinez, four buildings housing chickens used for egg production were destroyed. Fire crews from Wiggins, Hudson and Fort Lupton continued to battle the fire late into the afternoon. The cause of the fire is unknown.